Dutch sunshine – for people. for nature. The sun started heating up the tent around 7am and turfed me out of my sleeping bag. Dave was still inside his when I had to get out the greenhouse because it was sweltering! I’m always too hot in the mornings anyway, and after a few day’s respite from the heat, I wasn’t in a good mood. But it was a beautiful day and after breakfast I cheered up a bit. Then when we got on the road, I cheered up a lot. It was a glorious morning from the bike – cool air rushing past us, warm sun on our skin, a canal full of ducks and their ducklings. Oh, and almost no cars! And the ones that do go past are super cycle friendly, yay! 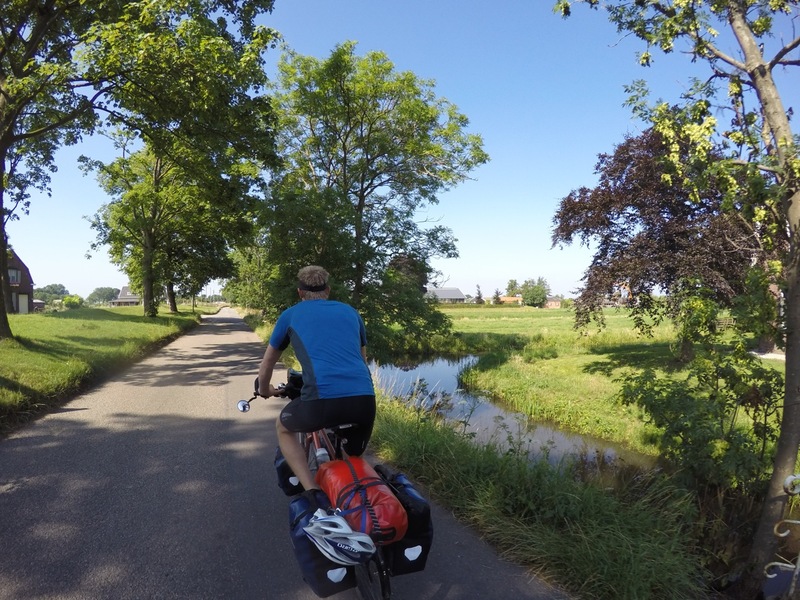 We spent all day on cycle paths as usual, sometimes alongside a main road, sometimes between fields and sometimes through woodland or along the water. We stopped every 20km as usual to have something to eat and drink. There were some nice places to stop today. The first town we came to was Gouda. 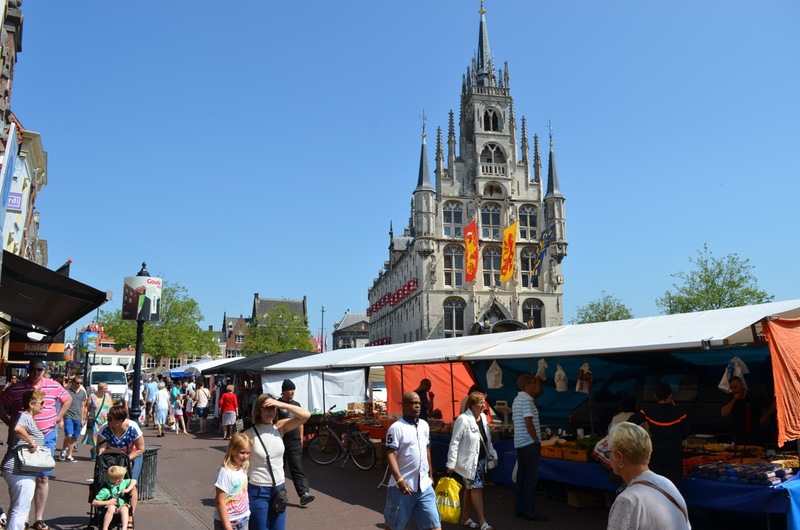 It had a market on and we stocked up on bread, cheese (gouda of course! ), stroopwaffels, pastries and dried fruit. 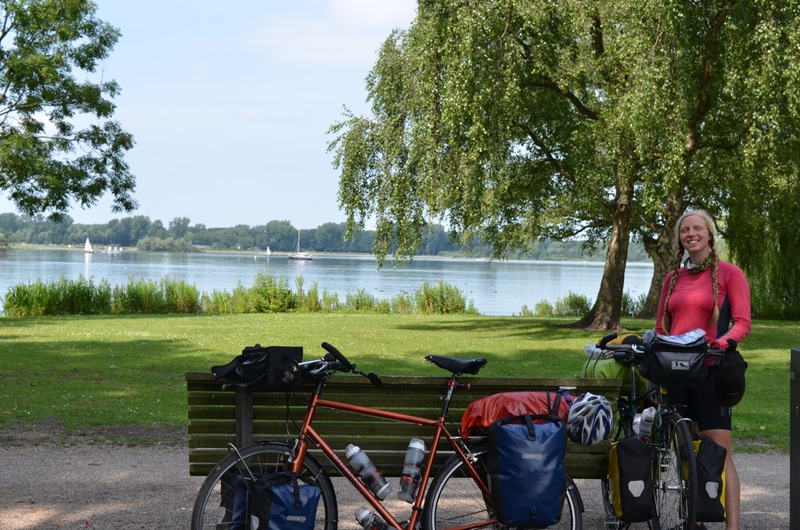 Our second stop was just outside Rotterdam, by a lake where people were sailing. And we had some entertaining characters walking in the park to keep us amused. Several blokes were walking incredibly small, disobedient dogs that either couldn’t keep up with them or just refused to. Sadly none of the men reduced themselves to picking up their dog and carrying it home, but there was a lot of futile whistling, walking away, walking back, then more futile whistling as the dogs just ambled around sniffing at things or standing still, resting their tiny tiny legs. 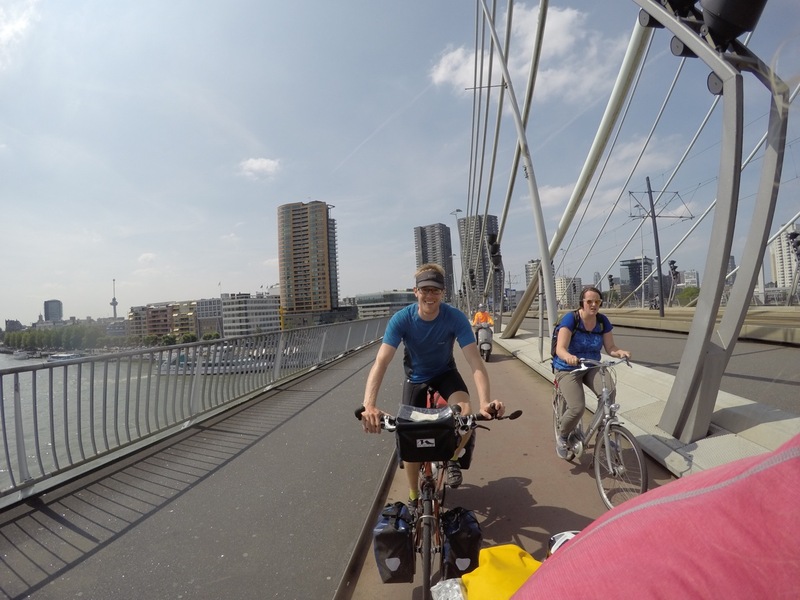 After lunch, we rode through Rotterdam. 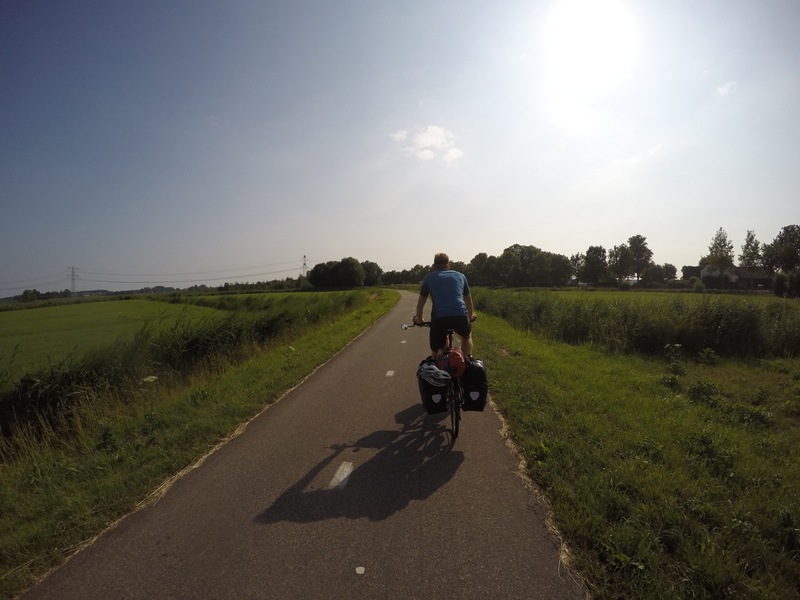 It was as cycle friendly as always but a navigation nightmare! 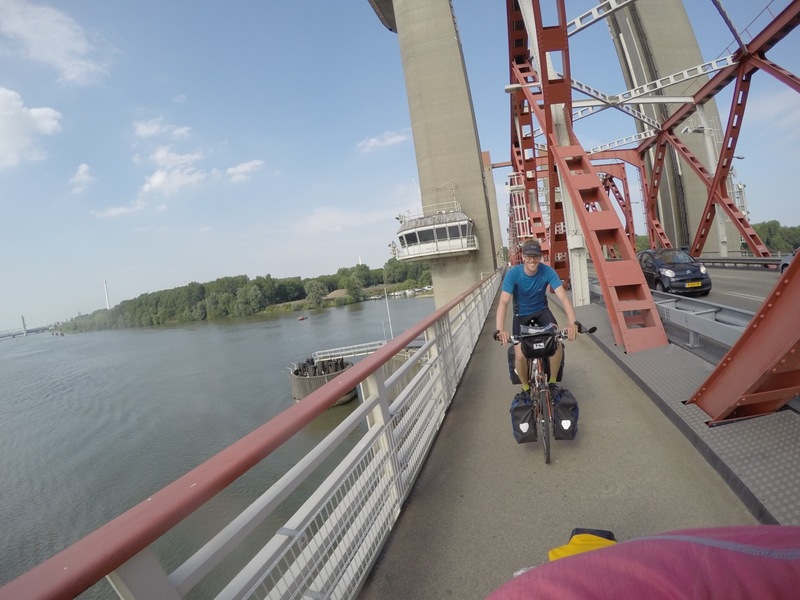 But we got to ride over some nice bridges and the weather was good so the detours went largely unnoticed. 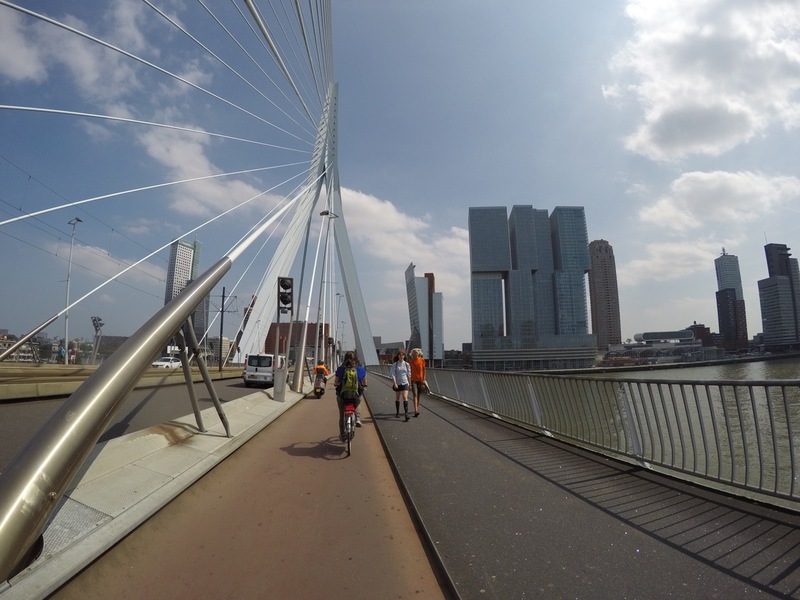 Bridge in downtown Rotterdam. Tram lines in the middle, then cars, then bikes, then walkers! Amazing. On the way out of town, we stopped at a supermarket then found a park to have second lunch in. Then we were campsite-bound. And a good thing too, it was somehow 5pm already! Still the weather was lovely and we continued to enjoy the 25 degree warmth and riding in the evening sun. 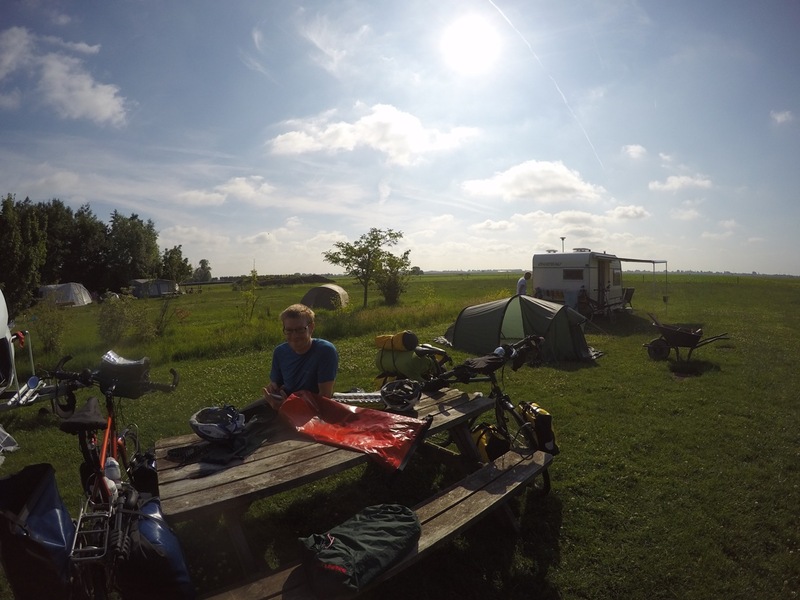 We got ourselves onto a countryside cycle path that went all the way to the campsite and arrived tired but happy, having done around 80km of gloriously easy Dutch terrain. Dinner was an unusual treat of burgers (in burger buns and everything!) with a side of cous cous salad. It was very nice, even if I say so myself. Although I wasn’t the one trying to clean the pan afterwards! It’s so flat that you can’t even see the horizon. The land just peters out around the curve of the Earth. We’re at another Natuurkampen tonight and it’s just as great as the others (minus wifi). A lush green field with some trees and a shower block – ahh. It rained a bit this evening but not as much as it sounded like it should have from the amount of thunder we heard! Tomorrow we’re riding across the islands towards the Belgian border.